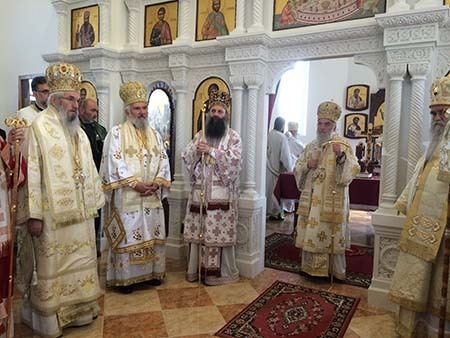 Jasenovac - The Holy Hierarchical Divine Liturgy was served at Nativity of St. John the Baptist Monastery in Jasenovac on Wednesday, April 22, 2015, during which a Pomen was served in memory of all those killed in the Jasenovac concentration camp, marking 70 years since the breakthrough of the last inmates. 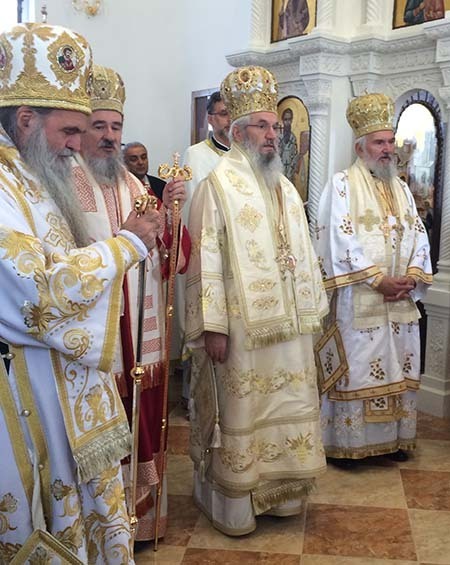 His Holiness Serbian Patriarch Irinej officiated at the Holy Hierarchical Divine Liturgy with the concelebration of two metropolitans - Amphilohije of Montenegro and the Coastlands and Porfirije of Zagreb-Ljubljana and twenty hierarchs of the Serbian Orthodox Church, among whom was Bishop of Canada Georgije. On this day in 1945 the last group of Jasenovac inmates escaped this infamous camp where the government of the Independent State of Croatia killed over 700,000 innocents people.